Geared towards serious entry level players who desire good quality equipment for training and competition. 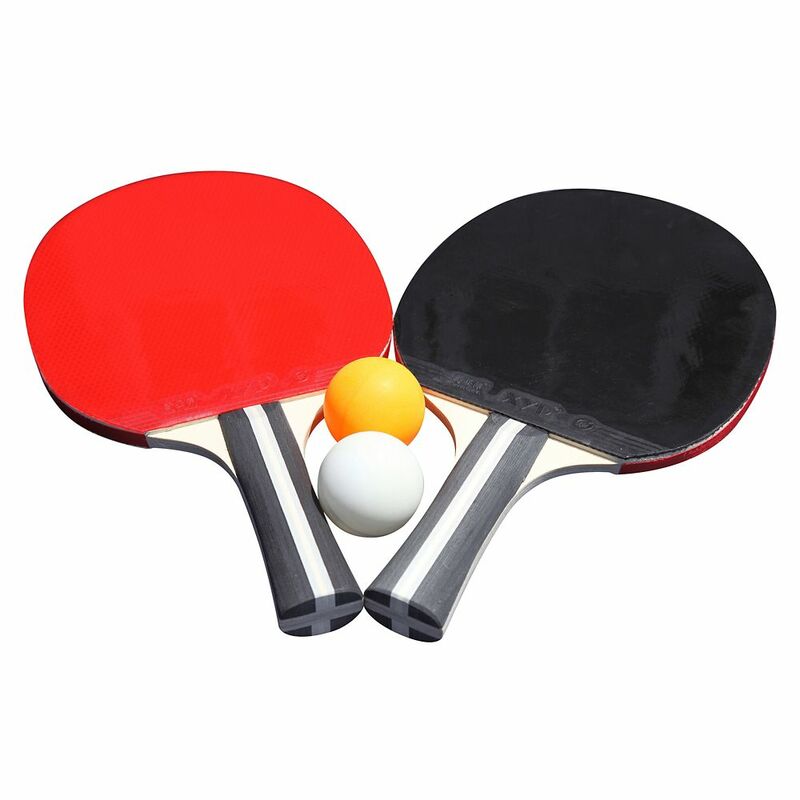 The Single Star Control Spin table tennis racket set includes 2 paddles and 2 balls. The two hardwood laminated blades sport high quality sponge rubber surfaces for superior ball control and hollow core performance handles. This set contains two 40-millimeter ping pong balls, 1 white and 1 gold. A vinyl zippered carrying case completes this handy quality table tennis accessory pack. The Augusta 8-ft Billiard table was designed to please even the most discriminating interior designers, showcasing traditional style and superior craftsmanship. The table cabinet is crafted from 1-in thick engineered MDF material covered in a Maple veneer, finger-jointed interlocking interior support beams and perimeter anchor blocks to deliver rigid rock-solid table stability. The 4.5-in solid Maple top rails featuring beautifully inlayed diamond sights and exclusive turbo-speed tournament tested K-66 profile gum rubber cushions provide active table play. The table is further enhanced by the polyurethane, color-blended deluxe shield pockets, intricately detailed ball and claw legs, 1.75-in thick MDF "Slatetronic" play surface, and a durable multi-step fine furniture finish. 180-day limited warranty. The Augusta 8-ft Non-Slate Billiard table was designed to please even the most discriminating interior designers, showcasing traditional style and superior craftsmanship. The table cabinet is crafted from 1-in thick engineered MDF material covered in a maple veneer, finger jointed interlocking interior support beams and perimeter anchor blocks to deliver rigid, rock-solid table stability. The 4.5-in solid Maple top rails featuring beautifully inlayed diamond sights and exclusive turbo-speed tournament tested K-66 profile gum rubber cushions provide active table play. The table is further enhanced by the polyurethane, color-blended deluxe shield pockets, intricately detailed ball and claw legs, 1.75-in thick MDF "Slatetronic" play surface and a durable, multi-step fine furniture finish in a rich Walnut. 180-day limited warranty. The Bristol 7 ft. Pool Table has the perfect combination of quality features and a compact size to easily fit in any room. The combination of the dark Cherry melamine cabinet finish and chrome-plated corner caps instantly creates a stylish addition to any game room. Durable Black plastic moulded drop pockets and EVA rubber cushions for accurate and fast ball rebound round out the great features on this billiard table. The included quick change over table tennis top adds another dimension of competitive fun within the same space. This set includes all the accessories you need to play pool and table tennis. Certain to provide hours of competitive gaming fun for you, your friends and family! 180-day limited warranty. Single Star Control Spin Table Tennis 2-Player Racket & Ball Set Geared towards serious entry level players who desire good quality equipment for training and competition. The Single Star Control Spin table tennis racket set includes 2 paddles and 2 balls. The two hardwood laminated blades sport high quality sponge rubber surfaces for superior ball control and hollow core performance handles. This set contains two 40-millimeter ping pong balls, 1 white and 1 gold. A vinyl zippered carrying case completes this handy quality table tennis accessory pack.